Our group started by conducting individual user interviews, a survey, and observations. Based on this information, we generated a list of the audience's trends. 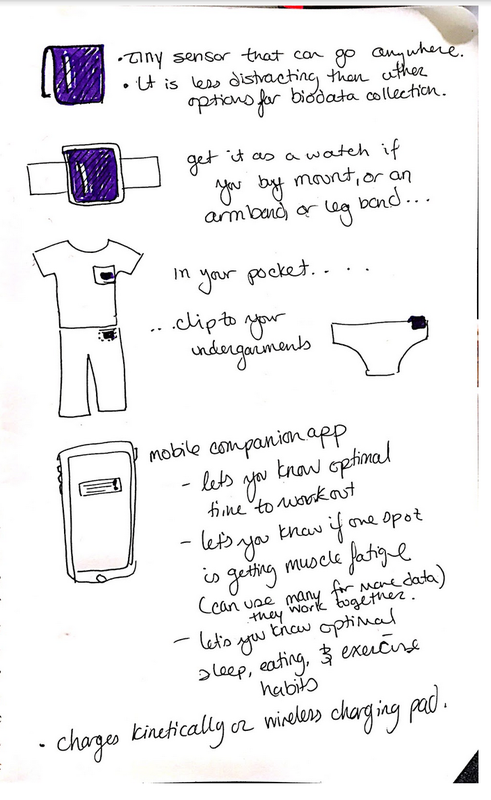 We then individually created sketches that addressed these trends. After identifying solution trends across all sketches, we narrowed our scope to three concepts that the group is interested in pursuing further. These three concepts are: The Always Available Personal Trainer, The Biological Data Sensor that can go anywhere, and The Social Motivator In the Periphery. We will focus on fitness and motivation. Our product will serve people already at the gym and/or exercising on their own, regardless of whether they are gym junkies or just getting back on the exercise bandwagon. The solution will need to be a modular, flexible system which meets individual's unique exercise needs and can move around with them throughout their day. It needs to be washable/cleanable and waterproof. “Augmented memory” be applied to this population through the tracking and compilation of the audiences’ health and fitness statistics and their friends’ statistics. Users who have great workouts often take classes or have personal trainers who help with form and push them to do them to do their very best. However, this can be very expensive, especially for those who are just starting out. Good instructors can significantly motivate the user and help them reach their fitness goals. Music and visuals engross the users and help them to achieve a better workout. Those who come to the gym with the right music are often more prepared and less distracted during their workout. These users tend to workout longer and better than those who are not prepared. Users with friends or were a part of an exercise group tended to be more consistent in their workouts that those who were not part of a group. Having tangible goals help users stay committed to their fitness goals. Some users rewarded themselves with dinners or new clothes as certain goals were achieved. Marathons and other high stakes competitions also served as motivation to stay committed to exercise. Many users noted being distracted by life events. Busy schedules, social events, kids, injury, and sickness were all were common reasons why users stopped exercising consistently. Users also mentioned that they would work out consistently for weeks or months at a time to only fall off the wagon and have a hard time becoming motivated again. There was an all or nothing mentality where users were either very good with health and fitness or very bad. Users also mentioned there was a strong sense of guilt after indulging on high fat foods and had difficulty going back to a healthy lifestyle. They would also use exercise as a way to be able to eat more or feel less guilty for eating. Users who exercise felt unmotivated by the lack or results or the right results. (No weight loss, weight loss instead of muscle gain) Novice users especially had difficulty understanding what types of exercises they should be doing. Useful for novice users that do not have enough knowledge on what equipment to use and what diet to follow. This is particularly helpful for those who have not done enough research on staying fit. This technology would help provide the right information to the user without him/her ever feeling the need to have a personal trainer. The technology could provide information such as heart-rate, calories burnt, body temperature etc. Use of videos or tutorials could help guide the user to do the right exercises and and follow the correct routine. Use of personalized exercises can help keep the user motivated. 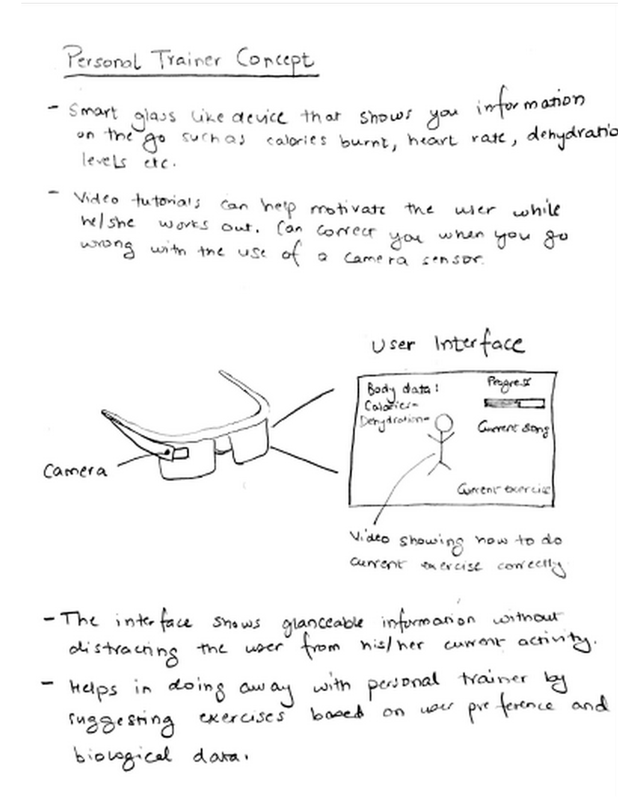 The concept will serve as a less distracting way to gather biodata than is currently available on the market. This allows users to concentrate on their routine and what they are doing instead checking their technology every few minutes while exercising. It can be clipped directly to clothing, strapped into an accompanying wrist or arm band, and/or put into a user's pocket. One device can also be used in harmony with additional devices on the user to gather cumulative biodata. In addition to collecting data on heart rate and sleep patterns, it will also collect data based on where it is placed on the body, proceeding information on muscle fatigue, workout efficiency, and respiration. In collaboration with an accompanying application, users will receive reminders informing them of optimal exercise time and intensity for each day, which muscles to give additional attention to, and when is the optimal time to get to bed or eat based on user's personal training goals. 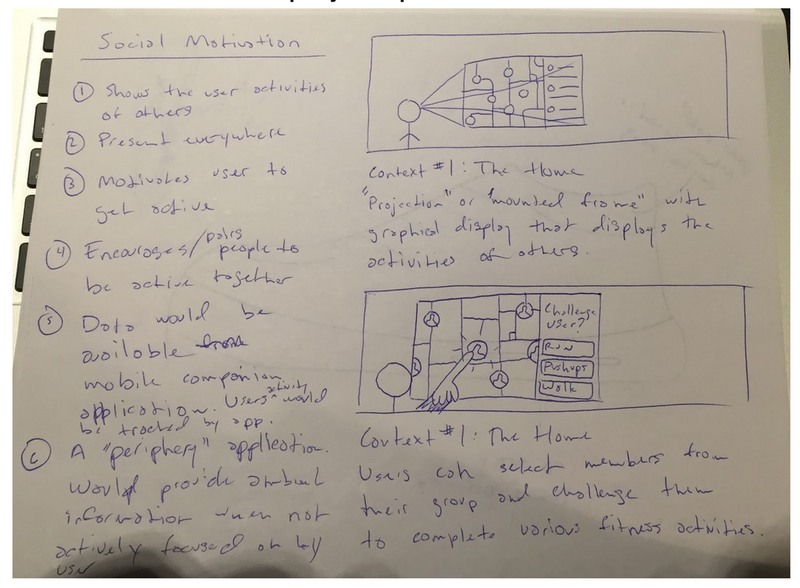 Concept which uses peripheral information to display constant information about the activities of others throughout the day through a graphical representation. Display would be ever-present as throughout the users’ daily activities through a projected screen, mounted picture frame or similar method. Users will be able to interact with the projection through touch to view additional data and to propose fitness challenges to other users. Data will be collected in multiple ways such as phone GPS, FitBit watch and other wearable devices. Importance of user privacy is acknowledged by giving the user anonymization options. We anticipate that by displaying peripheral information about the activity of those around them and through challenges that users will become more motivated to exercise more throughout the day and to maintain a healthier lifestyle.